While I sometimes make moral arguments against the current tax system (because it is corrupt, because it doesn’t treat people equally, because it provides unearned wealth for insiders, etc), my main arguments are based on economics. High tax rates on workers and entrepreneurs discourage productive behavior. Double taxation on income that is saved and invested discourages capital formation. Tax preferences and other loopholes bribe people to use resources inefficiently. These are the principles that explain why I like tax reform, why I promote the Laffer Curve, and why I advocate for tax competition. Maybe it’s time, however, for a back-to-basics primer on taxes and behavior. That’s why I’m very glad that Professors Tyler Cowen and Alex Tabarrok of George Mason University (and the Marginal Revolution blog) are producing videos on various economic principles. And I particularly like a video they produced which uses supply and demand curves to show how taxes reduce economic output. But before we watch that video on taxes and “deadweight loss,” here’s a video on how supply and demand curves interact. Feel free to skip this video if you feel confident in your understanding of these economic concepts (and also feel free to watch this video on the demand curve and this video on the supply curve if you don’t have any background knowledge and need to start at the beginning). Now let’s look at their first-rate video on how taxes lead to less economic output and foregone value for both buyers and sellers. Very well done. I particularly like the closing example showing how the so-called luxury tax backfired. Here are a few of my thoughts to augment Professor Tabarrok’s analysis. 1. The video looks at how taxes affect the equilibrium level of output for an unspecified product. Keep in mind that this analysis applies to “products” such as labor and investment. 2. It should go without saying (but I’ll say it anyhow) that ever-higher tax rates impose ever-higher levels of deadweight loss. 3. The point about avoiding taxes on goods where there is high “elasticity” has important lessons for why it is foolish to impose class-warfare tax rates on people who have considerable control over the timing, level, and composition of their income. 4. This analysis does not imply that all taxes are bad. Or, to be more precise, the analysis does not lead to the conclusion that all taxes are counterproductive. If government uses money to provide valuable public goods, the overall effect on the economy may be positive. P.S. 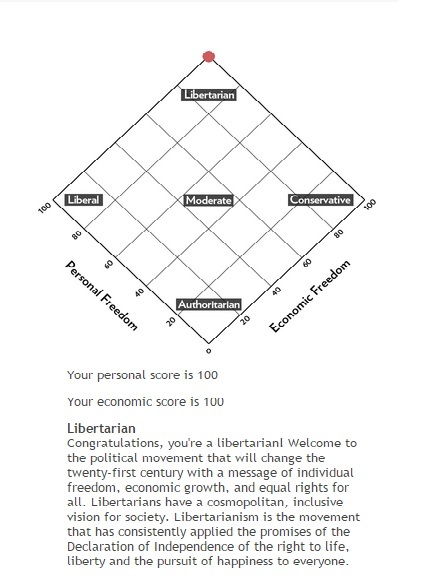 I’ve shared a couple of tests that allow people to determine their philosophical/political leanings, including the libertarian/anarchist purity quiz, the circle test to see where you are on the spectrum from socialism to voluntarism, and a candidate affinity test. I’m a sucker for these quizzes, even when they don’t make sense. And if you like these tests (particularly one that does make sense), then you’ll enjoy this quiz from David Boaz’s new book, The Libertarian Mind: A Manifesto for Freedom. You’ll be shocked to learn I got a perfect score. Which is probably a good thing since David is one of my bosses. The Princess of the Levant will snicker at the thought of me being described as “cosmopolitan,” but I’ll tell her that even a rube can have a cosmopolitan vision of society. And remember, libertarians also have the self confidence to enjoy self-deprecating humor, so we must be good folks.